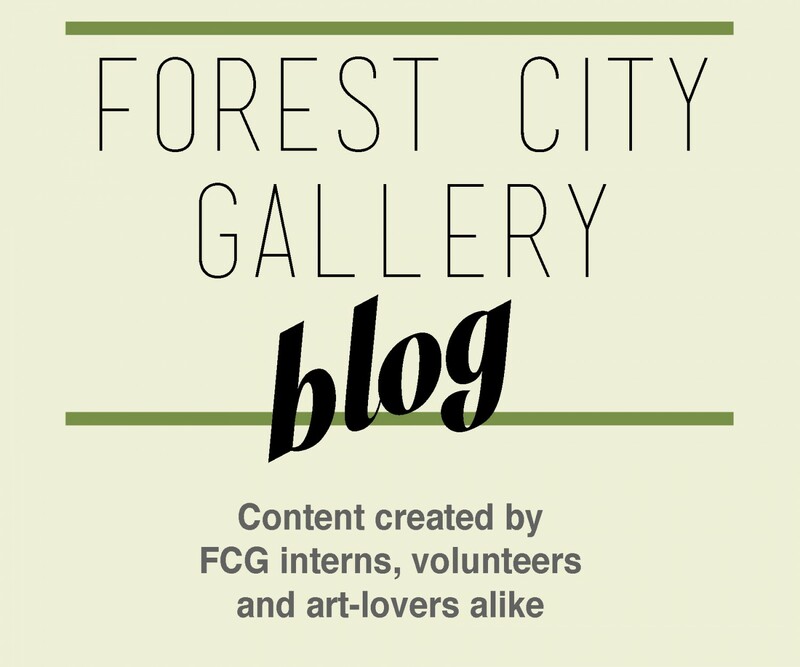 Forest City Gallery’s Intern, Delaney Brown, spent a few days contemplating FCG’s current exhibition the Introverts. Below, Delaney offers some observations about the fragmentation of memory and the visual language employed by the exhibiting artists in relation to the same-named short story. Forest City Gallery presents the Introverts, an exhibition that is featuring works by Mélanie Myers, Robert Taite and David Woodward. the Introverts is open at FCG during regular hours from June 17th, 2016 to Friday, July 29th, 2016. The short narrative ‘the Introverts’, written by Jenna Faye Powell, the director of Forest City Gallery, provided the conceptual inspiration for the group exhibition. The three artists made original works for the exhibition. The exhibition statement informs viewers that the artists were encouraged to consider memory within their practice as well as “color and sanctuary”. The short narrative is also available to read while visiting the space. ‘the Introverts’ is not written in a chronological narrative of memories. The narrator recalls brief moments that were deeply affected by the story’s catalyst, the color blue. They call to mind how blue influenced the individuals and objects within the room. This gives the story a sense of fragmentation. Fragmented memories, based on the recollection of color, are apparent in the work of the exhibiting artists. Mélanie Myers interprets the text through large-scale, pencil crayon drawings. Myers was specifically inspired by the quote from the text: “It usually took a few minutes for her eyes to adjust to the atmosphere”. The series of drawings by Myers are curated in a way that her work becomes increasingly familiar: the spaces become more recognizable and the details more clear. However, as the image focuses, the impact of fragmentation (due to the influence of color on memory) is apparent. The details remembered through the lens of blue, fragment and distort reality but also show close ties to reality. In Myer’s lone-framed drawing, Sans Titre, the landscape is mountainous but also shown as a table top surface. The legs that hold the table appear to be an assortment of randomly selected domestic objects that support the table – they appear clearly personal, from the filing cabinet to the very particular decorative lamp. These objects are more opaque in color and consciously layered and collaged during the drawing process. This begs of the question: how do these objects relate to the narrative and why are they so vividly important? This drawing parallels the exhibition statement by clearly demonstrating simple symbolism but also offer rich, personal narrative. David Woodward’s collages use color and form to entice reactions from the viewer. By placing neutral coloured paper over seemingly conflicting images or slates of color, Woodward allows the viewer to interpret the color and form, drawing upon themes in the short story. The concern of fragmented memory is represented in the incomplete, sometimes jagged, unfinished images in the collage. By breaking the foreground into several shapes within one collage, Woodward allows the viewer conjure multiple memories within each piece. Like Myers’ work, the collages act as a visual simulation of the short story embedded with personal narrative, inside jokes and ambiguous space to allow for further interpretation. The reaction to the space and color is purely based on the connection of memory projected onto the collages by each viewer. After reading the exhibition statement, it appears that the collages produced by David Woodward for the Introverts exhibition was a continuation of his study of visual languages based on his audience’s background. The pieces by Robert Taite offered the most opportunity to connect memories with the work. When looking at the painting/sculpture hybrids, I examined the work in two steps. The first was to look at the piece as an architectural space or a blueprint. To connect the form with a space in my memory. The second step was to look at the colors used to paint the architectural forms. His minimal presentation in the paintings allows viewers to examine the memories associated to the architectural forms in a more in depth manner. Tate’s work is accessible and challenging, as the work that most clearly depicts the short story. the Introverts exhibition at the Forest City Gallery allows viewers to recollect on memories through association to colour, allowing our senses to drag us back to a particular moment or feeling. The three exhibiting artists created original pieces for the exhibition that conjure multiple readings that relate space and colour, alluding to the pliability of our ever-changing memories.